• Drugs that act directly on the renin-angiotensin system can cause injury and death to the developing fetus [see Warnings and Precautions (5.1)]. Irbesartan is indicated for the treatment of diabetic nephropathy in patients with type 2 diabetes and hypertension, an elevated serum creatinine, and proteinuria (>300 mg/day). 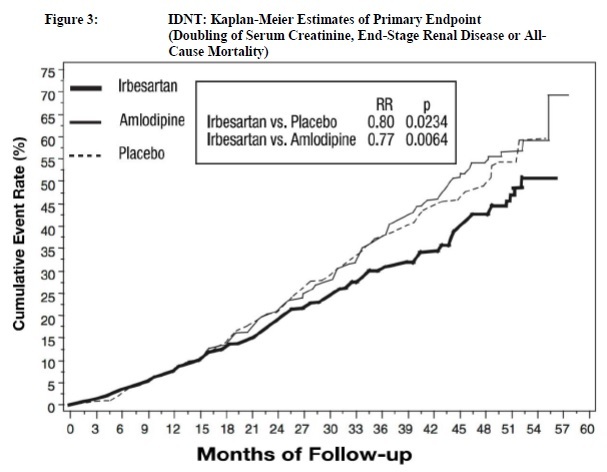 In this population, irbesartan reduces the rate of progression of nephropathy as measured by the occurrence of doubling of serum creatinine or end-stage renal disease (need for dialysis or renal transplantation) [see Clinical Studies (14.2)]. 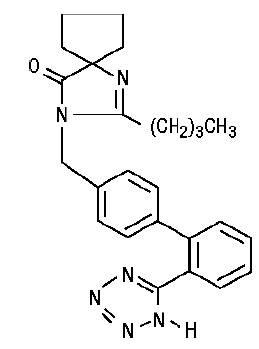 In patients with an activated renin-angiotensin system, such as volume-or salt-depleted patients (e.g. those being treated with high doses of diuretics), symptomatic hypotension may occur after initialization of treatment with irbesartan. Correct volume or salt depletion prior to administration of irbesartan or use a lower starting dose [see Dosage and Administration (2.4)]. Acute oral toxicity studies with irbesartan in mice and rats indicated acute lethal doses were in excess of 2,000 mg/kg, about 25-and 50-fold the MRHD (300 mg) on a mg/m2 basis, respectively.